Designed for cold-weather fishing, the Tough Puff Hoody covers all the important bases: warmth, breathability and freedom of movement. Durable enough to push through tangled cover on the way to the water, it features a strong, stretchy and abrasion-resistant face fabric that moves with your body and, thanks to a DWR (durable water repellent) coating, shakes off moisture or passing showers. Highly breathable 60-g FullRange® polyester stretch insulation lets you swing flies all day in comfort—whether you’re wearing the Tough Puff as an outer layer or as a midlayer under a wading jacket in wetter conditions. The streamlined wrist cuffs have a simple elastic opening, and the interior arms have the same water-resisting DWR finish as the exterior—meaning you’ll get the least water uptake possible from willfully dunking your arms up to the elbows in the river. 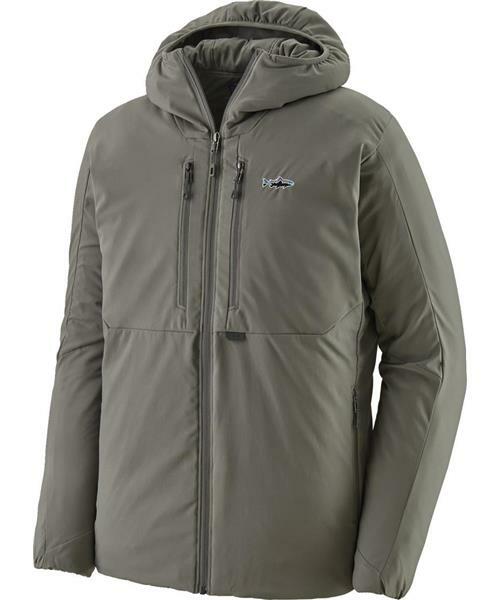 Two large, vertical fly-box pockets, two zip-closure handwarmer pockets, an easy-access tool attachment point below the left fly-box pocket, and a moisture-wicking, 100% recycled polyester Capilene® interior lining round out the technical package. Fitz Roy Trout logo on the left chest.